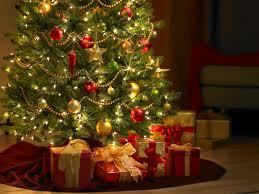 Christmas trees are beautiful, but if you don’t take the proper precautions, they can also be very dangerous. With electrical wires, breakable ornaments, ribbons and tinsel, make sure you’re safeguarding your little ones and pets from a christmas tree disaster. 1) If you have a cat or other animal that likes to play around your tree, try spraying perfume or some scent around the bottom of the tree. Cats especially find smells offensive and will stay away. Make sure to spray near the trunk of the tree since they have a tendency to want to clime up the trunk. 2) Children, dogs and cats love to touch shiny, sparkly objects. If you have any breakable ornaments, consider putting them up high in the tree away from hand’s or paw’s reach. Plastic ornaments are just as beautiful, and won’t cause harm or a mess. 3) Stay away from tinsel and ribbon. As silly as it might sound, these can be a choking hazard. Although they can add a nice look to the tree, the best thing to do to avoid costly disasters is to simply not use them. If you do use them, keep them above reach level. 5) If you have a live tree, make sure it says well hydrated. A dry tree is more prone to catching fire, so you can thwart this type of incident by simply watering your tree, perhaps every other day, if necessary. We hope you and your pets have a very safe and Merry Christmas! This entry was posted on Saturday, November 23rd, 2013 at 5:09 pm	and is filed under Articles, News & Updates. You can follow any responses to this entry through the RSS 2.0 feed. Both comments and pings are currently closed.